Wherever possible the 1:625 000 scale bedrock geology linework and stratigraphy were adopted in the cross-section construction. In practice it was necessary to simplify some of the detail in terms of minor intrusions, minor faults and lithological facies variations within individual units. Significant faults are depicted as offsets of the geology rather than as actual fault objects within the workspace. Superficial geology is excluded from the sections. This implies that where superficial deposits are present the bedrock unit floods up to the DTM (surface) in sections. In general the thickness of superficial deposits is insignificant at the intended model resolution. The depth cut off is variable depending on the nature of geology, it is generally 1.5–3 km but lies deeper where major aquifers and potential mineral or hydrocarbon sources are thought to be present within sedimentary basins. A false horizontal base at an arbitrary depth has been constructed for some units to correspond to the base of the section, these should not be interpreted as true bases. Boreholes are hung from the given OD start height in most cases. Where a start height is not provided on the borehole log, the borehole was hung from the DTM. Illustration of national or regional bedrock geology for scientific publications and for public information and non specialist use e.g. Radwaste (Powell et al., 2010), Shale Gas (Mathers et al., 2012a). The intended resolution of use is the 1:250 000–1:1 Million range. Catchment-basin scale first-order calculated volumes of structurally simple stratified geological units performed in GSI3D and exported. These have been mainly used to-date for hydrogeological modelling. 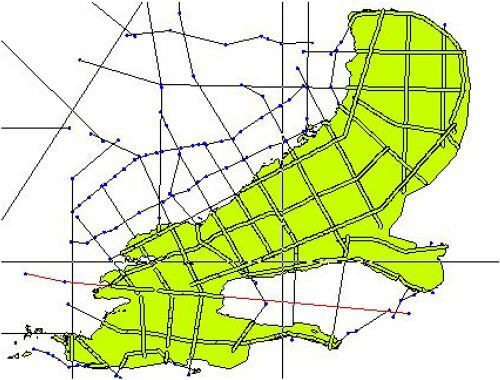 Regional GIS projects including the extents (x, y) of individual geological units (generated for use in GIS from GSI3D). See example in Figure 19. Detailed geological assessments of any kind, e.g. borehole, site or linear route prognosis. Resource-reserve estimation and exploration of any kind. Any representation or use outside the intended regional to national (1:250 000 to 1:1 million) resolution range. With the exception of the 314 deep boreholes incorporated into the sections the model is not easy to assess in terms of uncertainty because it does not show the distribution of much of the other underpinning information including other boreholes, detailed surveys and seismic lines together with higher-resolution local and regional geological 3D models built using these primary datasets. Figure 19 Distribution of the Grey Chalk Group derived from the information in the individual sections and the surface outcrop polygons enabling the construction of a full outcrop-subcrop distribution (a.k.a. coverage, envelope). ↑ Powell, J H, Waters, C N, Millward, D, and Robins, N S. 2010. Managing Radioactive Waste Safely: Initial Geological Unsuitability Screening of West Cumbria. British Geological Survey Research Report, CR/10/072. 73pp. ↑ Mathers, S J, Bloomfield, J P, Smith N J P, and Terrington R L. 2012a. iHydrogeology WP1: A revised geological fence diagram for England and Wales. British Geological Survey Internal Report, CR/12/056. 25pp.